I awoke this morning and had an idea of a very new and inspiring project. It is something that I have never done before but I am inspired by a very close friend of mine. His work is very different and indeed the basis for my new creation. Thank you in advance Patrick. 🙂 I can honestly say that Christmas has been so misconstrued and geared toward buying the right gift or the amount. 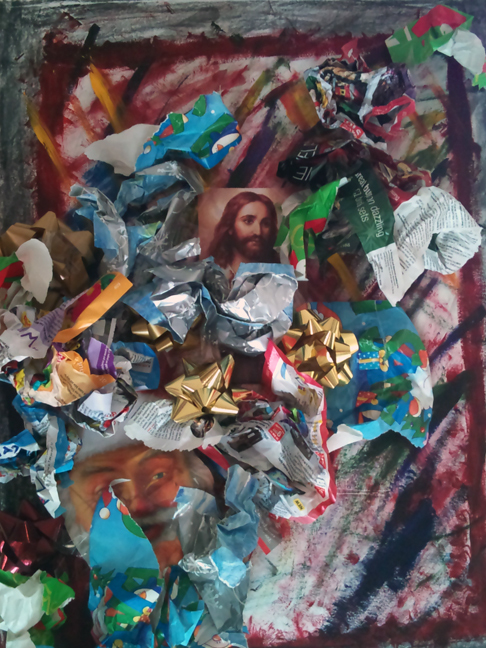 This piece represents all the chaos and consumption that everyone gets wrapped up in. We all forget the whole purpose of Christmas and I myself get tangled up in all the material side effects of it. Not sure when I will be finished with it, it is a work in progress but I finally am able to feel free, and hoping to add more to this project in the future… Will post my progress. This entry was posted in Photography, This Life of Mine and tagged Art, Christmas, Church, Family, God, Holidays, Life, Love. This is a really creative idea for a project! It mirrors my same emotions toward Christmas this year. To counteract it, my family has opted for a smaller Christmas where the focus is on time spent together not time spent opening presents. Look forward to your progress!